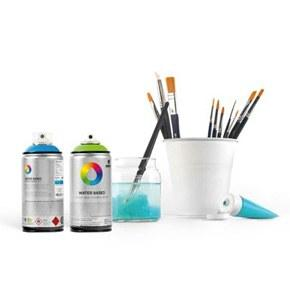 MTN Water Based 100 Spray Paint - 100ml - W1RV1021 - Cadmium Yellow Medium is a low pressure smaller 100ml water-based spray paint can with a matte finish that is perfect for indoor or outdoor use. This non-toxic spray paint formula comes in a multitude of colors and can be mixed with acrylics while wet, yet permanent once dry. Montana Colors Water Based 100 Spray Paint W1RV1021 - Cadmium Yellow Medium 100ml - mini-sized spray can color is a full middle to a dark yellow hue.